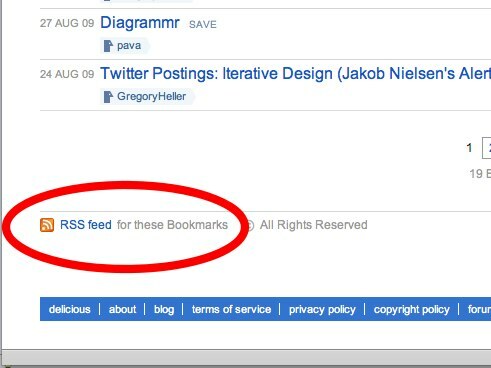 Last year I wrote about how an organization could aggregate shared bookmarks from multiple people and present them on their website. In the recent redeisgn of CivicActions.com we implemented this functionality. You can see the shared bookmarks feed in the center column at the bottom of the home page, or you can look at a more complete list. What follows is a few screen shots that point out exactly what you need to do on Delicious to make this happen. You will want to review the above referenced blog post for a step by step. These screen shots correspond to steps 5 through 10. 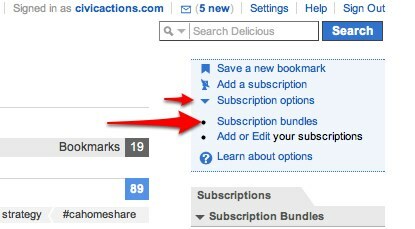 Step 6: Click on “Add a subscription” link under the search box on the right hand side. Step 8: Click The Check box for “From Specific User” and enter the user name of that user. Click on the “Create” Button to create a new bundle. tag bundle. 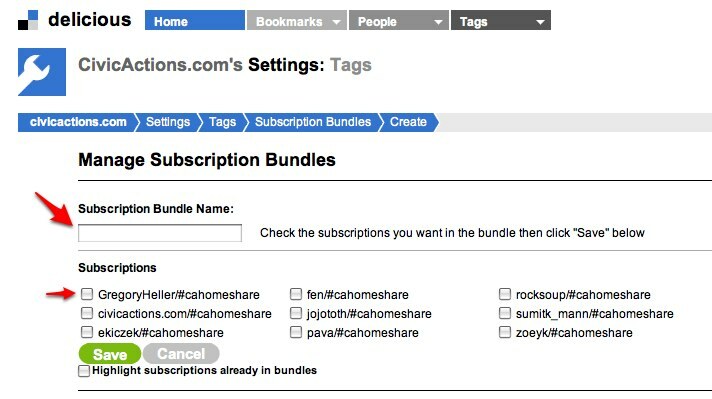 After you have named the Bundle you can select from your various subscriptions and add them to the bundle. 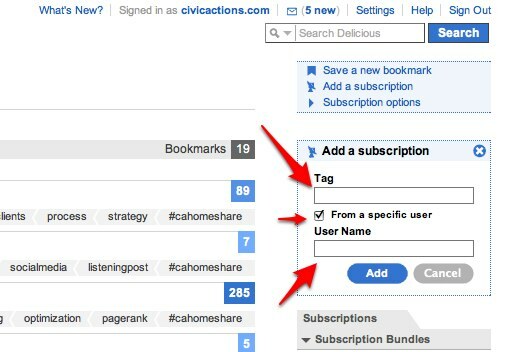 What you can see in the screen shot below is that the civicactions.com twitter account is subscribed to the tag “#cahomeshare” for a number of different delicious users who are members of the CivicActions team. I can then select which of these subscriptions to include in a subscription bundle. The reason to do this is to prevent tag polution from showing up on your website. Instead of listening to ALL delicious users for bookmarks with a particular tag, your subscriptions limit the bookmarks to only those created by specific delicious users with the selected tag. This gives you a high level of control of what could show up in your feed. 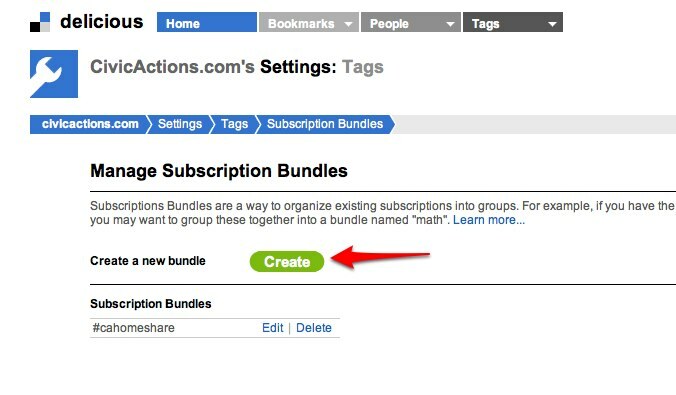 Finally, and this was listed as Step 9 in the original post, you grab the RSS feed for this subscription bundle and can use that in a reader, or in your website (if you are using drupal you can use the Aggregator module). There are also many services that let you create widgets from RSS feeds. At the bottom of almost every page on delicious, and also in your browser address bar, you will see a link to an RSS feed.